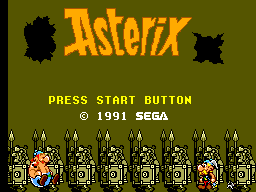 Astérix is a platform game for the Sega Master System. It tells the adventures of Asterix and Obelix as they attempt to rescue their village elder from Romans. Astérix was praised for using Master System's abilities to the limit and praised as one of the finest Master System games ever made. It was very well received and spawned several sequels in both 8-bit and 16-bit Sega gaming consoles.